This year unlike past years my little monkey did not want to dress up. We ended up bring his costume in a bag to daycare since he did not want to wear it on Friday morning. Of course, he put it on once I left with no problem (he always behaves at daycare, its a conspiracy I know it). Then all day on Saturday he was talking about going Trick or Treating. So after dinner of Pizza with both sets of grandparents the big moment arrived "Monkey, Do you want to get into your costume?" the reply "nope". That stayed the reply for the next half hour as grandparent after grandparent tried to convince, bride, sucker him into his cute Dino costume. Then finally momma took charge, by picking him up and wrangling him into his costume. 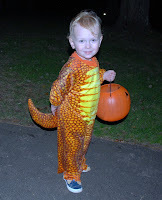 After many a tear my little dino walked out the front door and happily trick or treated as several houses in the neighborhood. When he got home he ripped the costume off and happily retold the tale of his trick or treating to his dad and adoring fan club (the grandparents). So two days later the little Monkey is still retelling his tale of trick or treating and how fun it was. I guess he has a selective memory in regards to the costume drama! That is hilarious. I was there last year, with both of my boys. This year, they happily leaped into their pirate costumes, started shouting "Aaaaarrrrrggghhhh!!!!" at the tops of their lungs, and were off to trick-or-treat. It'll get easier. And, he's absolutely adorable! Cheers! Kids are too funny like that. My son was so excited for his costume this year and then absolutely wouldn't wear it for Halloween. It was no big deal. Everyone had fun anyway. At least you have some cute pics after all the hassle. The costume is adorable! I was doing my own stuffing of a toddler into a furry get-up over here. I hear ya! I had the most adorable Care Bear costume for our 3.5 y.o this year (and she LOVES Care Bears), but oohhh noooo. Tears, snot, tantrums. She ended up in a Barney costum that daycare put her in before I picked her up. What's up with that?